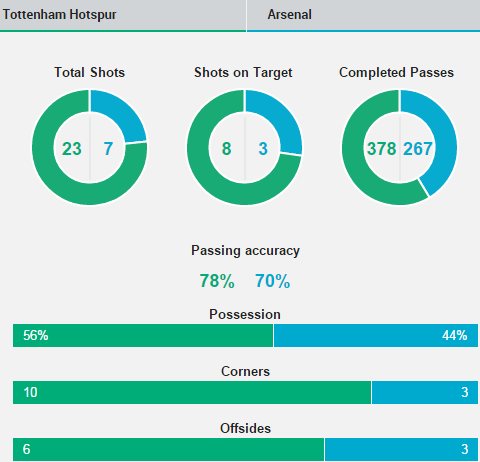 Tottenham vs Arsenal match ended with 2-1 scoreline in English Premier League 2015. Kane scored two valuable goals for Tottenham in this match. Full Time Score : Tottenham 2-1 Arsenal. Spurs have lost just one of their last six Premier League home games against north London rivals Arsenal (W3 D2 L1). Theo Walcott has scored four and assisted three goals in his last six Barclays Premier League appearances against Tottenham. Emmanuel Adebayor has scored more goals in north London derbies than any other player (10 – eight for Arsenal, two for Spurs). Adebayor is one of only two players to score for both sides in a north London derby along with Jimmy Robertson. Spurs and Arsenal have drawn 18 times in the Premier League, making it the most drawn fixture in the history of the competition. Tottenham have kept just one clean sheet in their last 32 Premier League matches against the Gunners. Arsenal have not managed back to back away wins in the Premier League this season and have only managed it once since January 2014. Tottenham have conceded the most penalties in the Premier League (6) while Arsenal have won the most (6). Olivier Giroud has scored five goals in his last six Premier League appearances. David Ospina has as many clean sheets in the Premier League this season as Wojciech Szczesny (3). Spurs are unbeaten in their last six Premier League home matches (W4 D2).